Astronomers have known for over 80 years that our Universe is expanding from an event called the Big Bang. In 2011, the Nobel Prize in physics was awarded for the even more exciting discovery that the rate of expansion is increasing, rather than slowing down as might be expected. The cause of this acceleration, referred to as Dark Energy, is not understood. The team has identified an important sample of galaxy clusters whose distances have been determined accurately enough to study how the density of galaxy clusters varies with the age of the Universe. To do this, they began with observations from the South Pole Telescope, a millimeter-wavelength survey telescope. Crucial follow-up work at the Blanco 4-meter telescope at Cerro Tololo Inter-American Observatory enabled them to refine cluster distances to within a few percent. The Blanco telescope, located in northern Chile, celebrates its 50th anniversary this year, but with modern instrumentation such as the Mosaic camera used in this study, it still plays a vital role in the cutting edge research. It has been known for decades that in the expanding universe the farther away an object is, the faster it is receding from us. Measuring velocity is based on an effect seen in everyday life: as an object moves further away, its light shifts to longer, or red, wavelengths (called redshift). As an object moves closer, the light wavelengths shorten, shifting to blue. This Doppler shift of light waves is used by highway patrols to measure the velocity of cars on the highway. Because of the expansion of the Universe, objects with large redshifts are not only far away, they are also observed as they were a long time in the past. When measuring distant objects in the Universe, astronomers refer to the redshift using the letter z. The galaxy clusters in this study have an average redshift, z, of about 0.6. At this redshift the Universe was only about half of its present age of 13.7 billion years. But the clusters span a range in distance from those close enough to be seen almost as they are in the present universe, to some with z as large as 1.4, which means we see them as they appeared when the Universe was less than a third of its present age. A related discovery from this work concerns what are called Brightest Cluster Galaxies, or BCGs – the biggest and brightest galaxy in each cluster. As Alfredo Zenteno, the second author of this paper, observed: "The position of a BCG within a cluster indicates if the cluster is undergoing some violent internal motion – perhaps because it has suffered a smashup with another cluster. By studying the frequency of such collisions, we learn if these clusters are unique or not. This is crucial to understanding Dark Energy in clusters." The image of the galaxy cluster Abell 3627 above shows X-rays from Chandra in blue, optical emission in yellow and emission from hydrogen light — known to astronomers as 'H-alpha' — in red. The optical and H-alpha data were obtained with the Southern Astrophysical Research (SOAR) Telescope in Chile. 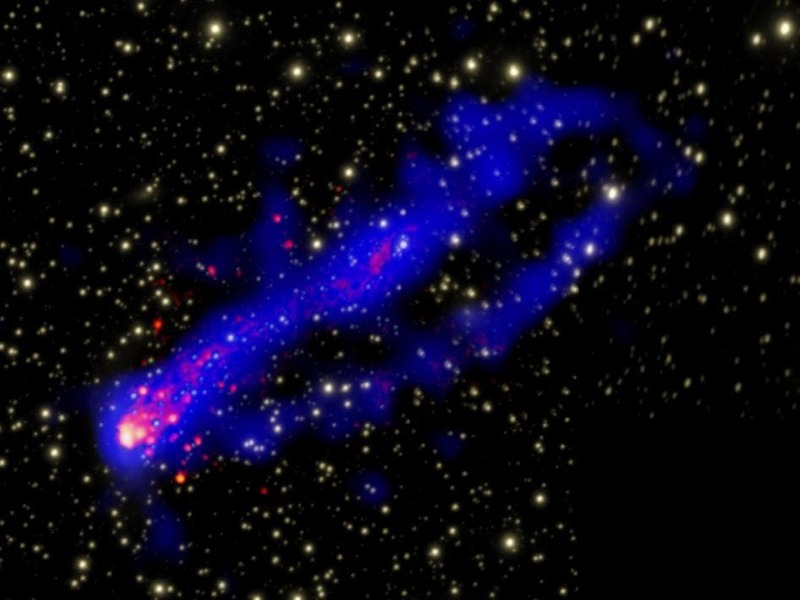 The X-ray tails were created when cool gas from ESO 137-001 (with a temperature of about ten degrees above absolute zero) was stripped by hot gas (about 100 million degrees) as it travels towards the center of the galaxy cluster Abell 3627. What astronomers observe with Chandra is essentially the evaporation of the cold gas, which glows at a temperature of about 10 million degrees. Evidence of gas with temperatures between 100 and 1,000 degrees Kelvin in the tail was also found with the Spitzer Space Telescope. In the image below, taken at the Blanco telescope, the boundary of the cluster of galaxies is marked with a dashed line. 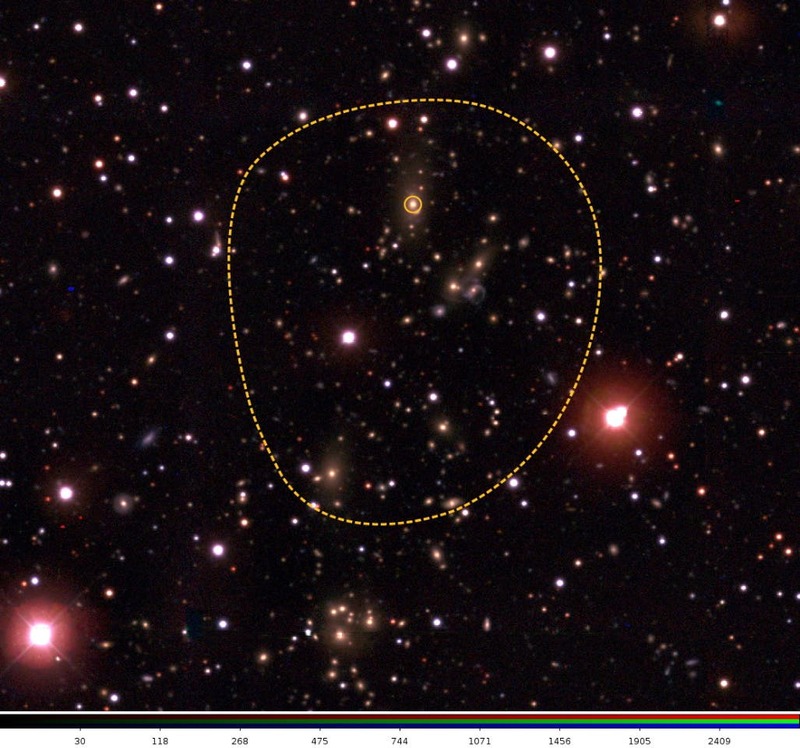 The brightest galaxy in the cluster galaxy (BCG) is circled. Image Credits: X-ray: NASA/CXC/UVa/M. Sun et al; H-alpha/Optical: SOAR/MSU/NOAO/UNC/CNPq-Brazil/M.Sun et al.